This weekend I will be participating in the local Market at Wesleyan College. This will be my second time there and I am very excited. Luckily TheBoy is going to his grandparents for a few days so We have plenty of last minute prep time. =D Let's hope this day is not as insufferable hot and the previous one... If your in the Middle Georgia area please stop by Wesleyan from 10-2 on August 1st. Its a market of plants, fresh vegetables and crafters and artists! So lately I am no good at transitions so I am just drawing a line (literally) and jumping to the next subject. I had a chance to do a blog interview with a fellow Etsy seller on her blog. It was tons of fun and I feel like I opened up quite a bit. Pop on over to FiberArtistToo and have a look! 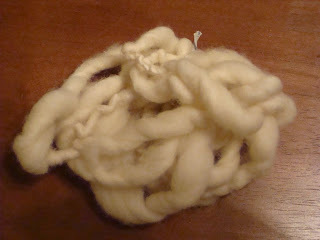 One of the pictures I sent that didn't make it on the blog is of my first handspun yarn. Okay, loosely its handspun yarn.... I have come a long way from where I was. This is why I tell people that it takes patience and persistence to spin. If I had stopped here I wouldnt have any of my beautiful yarns to show for it. So for all those newbie spinners who think it should be just so that first time.... relax. It just takes time.